Another good score, but this does come from the google.ca site rather than the larger .com site! This page has a little too many words and a low keyword density on the page. I would suggest that the content be trimmed down and which would also assist with the density. But let's look a little closer. The keyword phase is in the title bar, however, it would work better if it had a little more prominent placement closer to the beginning of the title. 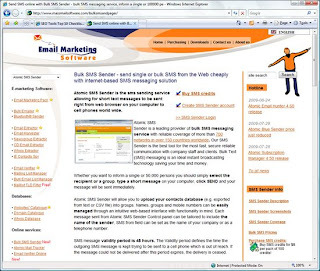 In this case the page may also be trying to target "send sms online" which does return a top 10 listing and does have this a the front of the title bar. Unfortunately, this site uses table layout which as we know is not as good as CSS layout but on top of that there is some malformed HTML with at least one missing end table tag which means there is most likely more HTML issues. Another point for Google analytics users, you will want to put the script at the end of the page so the search engine bots don't have to go through it to get to your good stuff. Remember the fundamentals of a well formed HTML page.